I’ll admit it, I ‘ve been a closet user of my girlfriend’s face and body wipes for years. They work great when I’m either on the run or just feeling a little lazy. 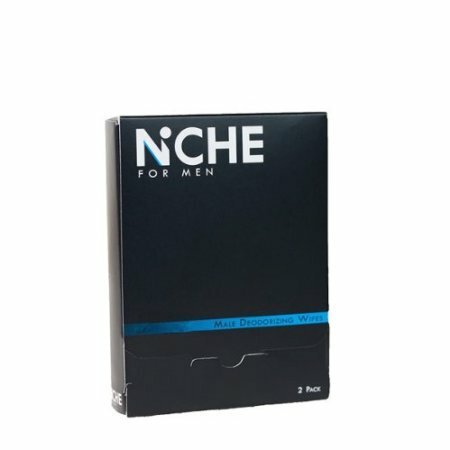 Well, one company has knocked on the closet door, and has invited men to try their own brand of deodorant wipes called Niche. the wipes come in a box which contains two towelettes. They are individually packaged in a 4″ X 3″ foil wrapper, so they are easy to tote with you on a date, to the gym, office, or on a camping trip. These are pretty generous sized at 9″ X 11″, so it actually is possible to give yourself a good overall cleaning with just one. However, we do recommend that you map out your stinkiest parts and save those for last (obvious, but you may forget if you’re in a hurry). I do like the subtle smell of cologne these leave behind, and they have passed my stinky gym feet test, which is good enough for me.